Well, it came to that fateful day when I told him it was time to...uhm.....let's just say a pot was mentioned. If we were going to have a life together, with children, it needed to start PDQ! I had always wanted a "big mixer," a KitchenAid mixer, but as a single girl, I just couldn't justify the price or the reason to have such a thing sitting in my kitchen all lonely and unused.....so I would putz around with my hand mixer and grumble if I had to "whip" up big batches of cookie dough and other such creations. Now we flash to Christmas 2000. There has to be a picture of the event in a box around here somewhere, and I promise I will share it with you as soon as I unearth it. The big story is that Tall Guy, who dislikes Christmas shopping very much, gave me a big, white KitchenAid mixer for Christmas! In itself, this is an awesome present, but he knew and I knew there was a bigger message there in the box. We did not become engaged until January, but that mixer told me he was finally ready to settle down and get married! 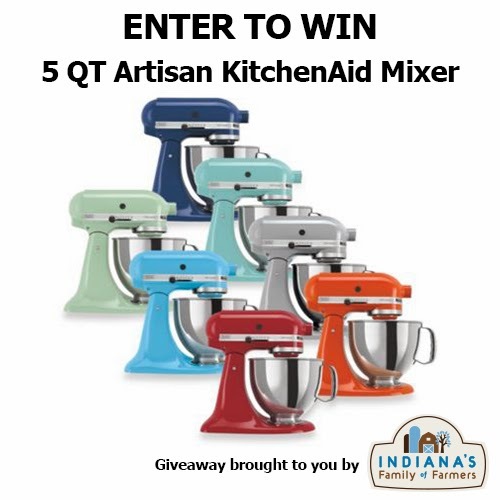 This is story is the big reason I agreed to share with you an opportunity to win your own KitchenAid mixer. Indiana Family of Farmers will put your name in the hat to win one if you will do them the favor of filling out a survey for them. This is a great group who keeps the lines of communication open between farmers and consumers. Click (#spons) here to take their survey, and good luck! You never know how a KitchenAid mixer can change a girl's or a guy's life! Wow, now that's love. The "don't ever buy her anything that plugs in" rule does NOT apply to farm wives.